The Jeep Wrangler doesn’t just boast a rugged appearance perfect for outdoor enthusiasts; it also excels both on and off the road. This means getting past snow and ice shouldn’t be an issue for a vehicle with a reputation for off-road excellence. If you don’t believe us, here’s a look at how the Jeep Wrangler can help you survive this winter season. 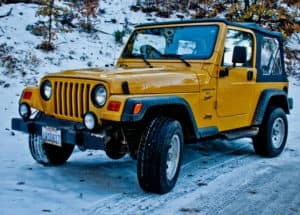 The Jeep Wrangler is a great choice if you live in an area where deep snow and ice are abundant. It also works well over rocky, sandy, and muddy terrain, so you don’t have to worry about your tires getting stuck or slipping off the path. The Wrangler’s ability to overcome tough surfaces is possible because of a powerful 3.6-liter Pentastar V-6 that sits under the hood of its latest models. Powering the 2018 Jeep Wrangler, this engine is capable of producing 285 horsepower and 260 pound-feet of torque, giving it all the power it needs to face any weather condition with ease. The steel front and rear tow hooks are also handy and can be used to rescue other vehicles that may be stuck in the snow. Plus, the main underbody parts of your Wrangler are covered with steel skid plates as well as electrical and body sealing. Combined with a high air intake for optimal engine breathing, these elements allow it to withstand up to 30 inches of water. You can expect awesome traction with any Wrangler, but the 2018 Jeep Wrangler JK definitely deserves some spotlight. This model comes equipped with a Rock-Trac 4×4 system ideal for taking on various obstacles and heights where low-speed crawling is a must. The Command-Track system is also helpful and transfers torque appropriately to all four wheels to maintain traction when driving over slippery or less-than-ideal surfaces, such as snow or ice in winter. If you opt for a model like the Wrangler Rubicon, you’ll find that it’s designed with a height to help you easily steer past uneven terrain without damaging the underside. It has 10 inches of ground clearance as well as an approach angle of 42.2 degrees, a break-over angle of 25.8 degrees, and a departure angle of 32.3 degrees. The Wrangler Unlimited offers similar specs, and these numbers help both vehicles stand out best in areas with tricky terrain. Like most vehicles, the Jeep Wrangler is equipped with hill descent control and hill start assist. These systems boost performance when going up or down a slope by monitoring throttle response, speed output, and braking power. And whether it’s winter, spring, summer, or fall, it’s always smart to make sure your vehicle has the right stopping power to keep you stable on the road. Fortunately, the Wrangler comes packed with standard features like electronic stability control, electronic roll mitigation, and four-wheel antilock disc brakes to help you stay in command no matter the season. As you can tell, the Wrangler is a rugged vehicle that doesn’t shy away from challenging road surfaces. It has the power and equipment to handle any type of weather, and it’s certainly tough enough to help you survive the snow and ice this winter.